This is the oldest thing (man-made) that I’ve ever bought. It’s a Roman coin from around 325 A.D. 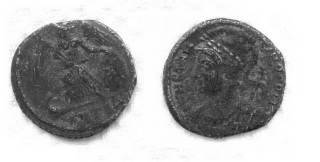 The reverse, on the left, shows Nike, goodess of winged victory and tennis shoes, and the front shows Constantine, emperor of Rome. He was the first Christian emperor, and he made his religion the creed of the empire, ensuring the long-term success of the cult of the Jewish messiah from that backwater, Palestine. Later on, some entrepreneurial monks forged a document claiming that he had also deeded the entire realm to the Catholic church, but that’s another story. His conversion was prompted by a dream, beautifully rendered by Piero della Francesco, in which he heard the message, “Under this sign, conquer!” And so, the Holy Roman (Roller) Empire was born.So many themes of contemporary interest here. Today, we have evangelical christians, and their sympathizers, who scream of being victimized by our secular culture. Or they claim that it is not REALLY a secular culture, but one based on faith in God (or so they wish.) I haven’t seen anybody being thrown to the lions, having their temples raided and sacked – no virginal devotees being raped, catacombs rifled through. Perhaps these people would feel better, validated, if that were the case. I suspect that they would like a leader to impose their faith on us all, as did the big C. Read all about it, “W makes evangelical christianity the law of the land!” Yes, in Maureen Dowd’s recent column in which she published her brother’s email, filled with howling taunts at the…everyone, her brother is recorded as saying, “…we don’t want people telling us what to do.” Really! But if the big C, or W, imposed a state religion, well, that would just ensure that we are all living in accord with God’s will and proper moral limits. Some people still don’t get the modern world. Right here in the USA. We like to look down on those backward peoples of the east, but our reconciliation with modernity is still an open process here. Or as W likes to say of evolution, “the jury is still out.” It’s hard to accept that we live in a society in which millions of people may feel that your own deeply held beliefs aren’t worth the ink they’re printed with, but what’s the alternative? The alternative is Constantine. This entry was posted on Tuesday, November 30th, 2004 at 3:53 pm and is filed under Uncategorized. You can follow any responses to this entry through the RSS 2.0 feed. You can leave a response, or trackback from your own site.